The magical holiday season is wrapping up. This season is a stupid busy time for me. I try to slow down but the weeks seem to unravel. In my adult life, I have lived away from my family and lifelong friends. My latest move leaves me about 14 hours away from the fun shindigs. I have to organize and travel is involved, life gets nutty. So yes, I get burnt out on this time of year and bad things cross my mind, hunting down reindeer for lunch sums up my feeling of hectic schedules and commercialism. And yet, it is a new year. I should try to be cheery and peaceful. Killing Rudolph is not the answer. It is with this sentiment that I have decided not to stab a reindeer and focus on hope for humanity, happy travels and good health. Count my many blessings. Reflecting upon my visit to Kauppatori and Market Square in Helsinki loaded with reindeer meat led me to consider the contrast of foods. 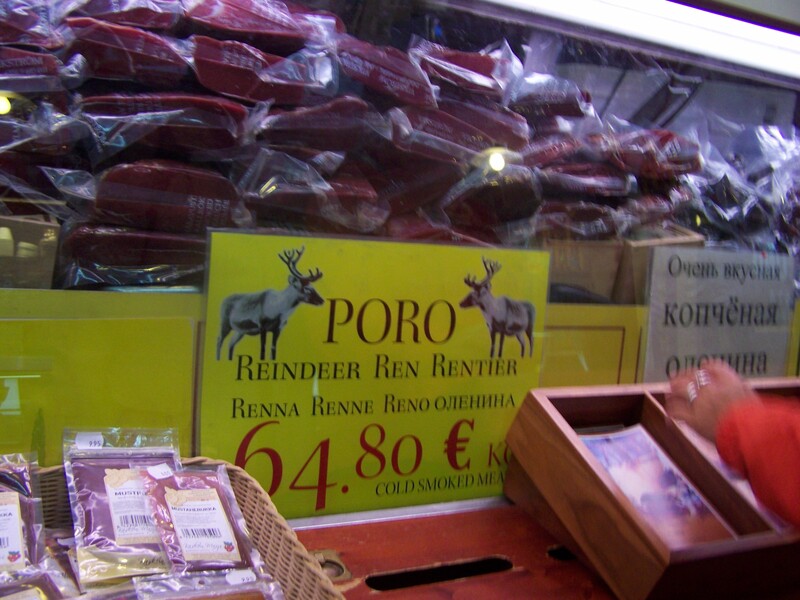 Reindeer meats symbolize the habits of old along with trying of the new. 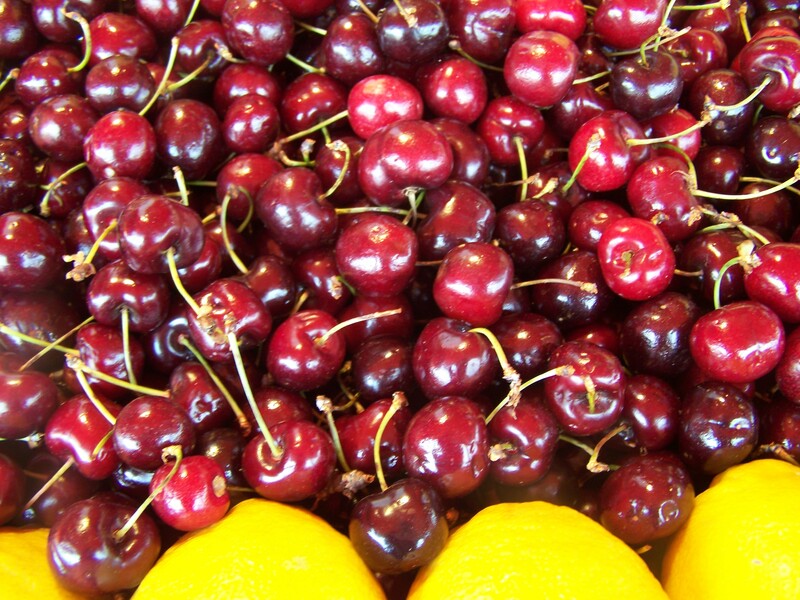 The amazing cherries symbolize hope, a youthful heart and prosperity. This cool place was a kick off of my bucket list. I stayed in central Helsinki adjacent to the trains and bus. Easy public transportation makes getting around a snap. Since I actually did chow down on reindeer and partake in multiple tastings of Finnish foods, liquors and beers, I walked. It was about 2 km and fantastic sights to see along the way. 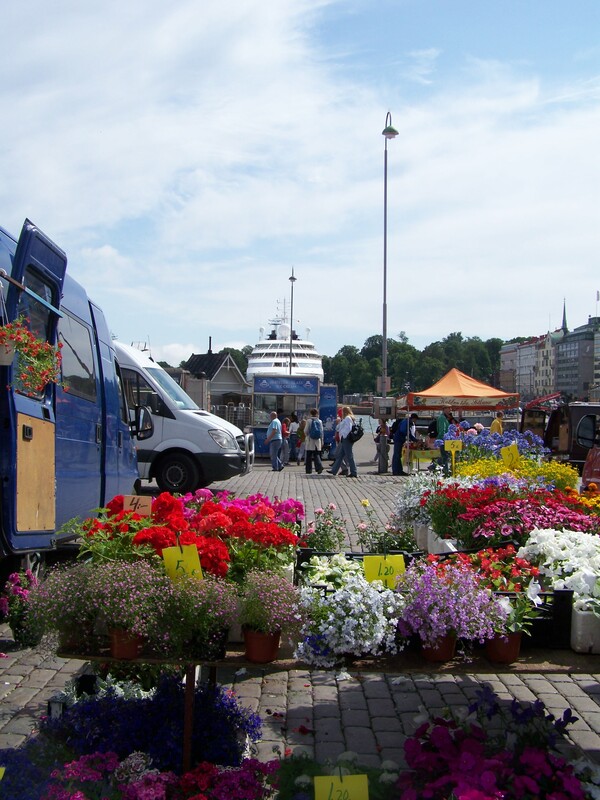 Located on the Baltic Sea, The Port of Helsinki is in itself an interesting stage for a market It is a small market. Locals DO shop here. Fishing boats pull up and sell fresh seafood. 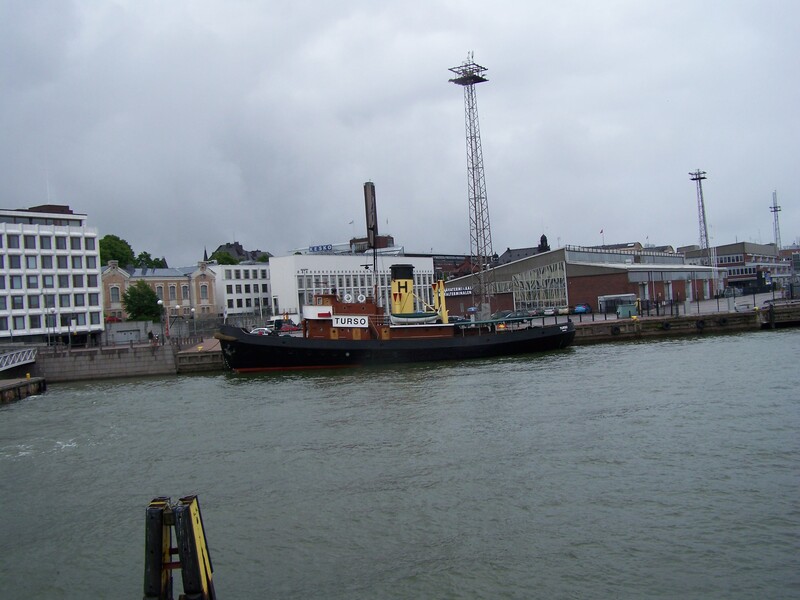 I stayed in Helsinki for a week and visited multiple times. I liked the place. The market goes on rain or shine. I went at different times of the day. 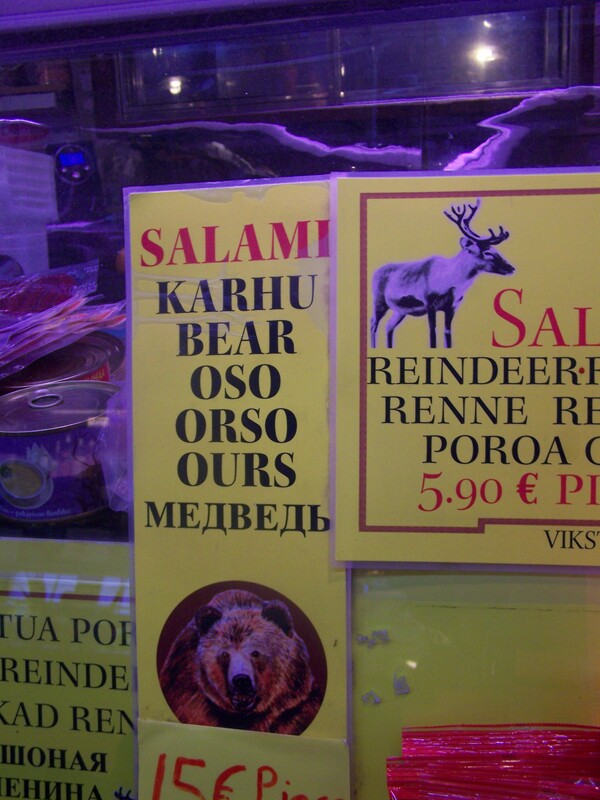 It is less busy early, but salmon soup and reindeer for breakfast-EH. That said, there is this jam filled and sugar rolled donut called “Possumunkki,” and great coffee. My hotel had one of the best breakfast buffets EVER and I did not need breakfast or lunch but was able to sample a bit. Hate birds, wear a net. I found really great food here. I ate tons of salmon and soups. My friend tried “lihapiirakka” which was a meat pastry. Reminds me a bit of a pasty, but it is sweet donut like dough, and then deep fried. Greasy and apparently delicious. Foods found here include: a salmon meal, salmon soup, fried whitefish, reindeer meat, reindeer meatballs, and potatoes. Vegetable and fruit vendors sell mushrooms, yellow or tan chontarelle. So many great berries: cloudberries, lingonberies, blueberries, gooseberries, famous strawberries and of course, the good luck cherries. All in all Helsinki is an expensive city to eat your way through. 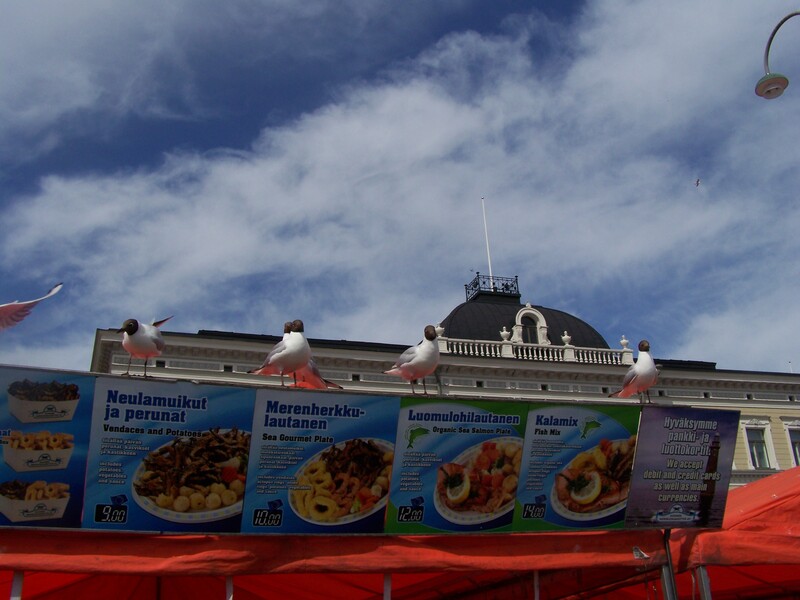 The Market is a fun place to try Finnish foods cheaper than in the restaurants. Next to the food vendors there are the usual souvenirs, and then some treasures: paintings, antlers, pelts, mink furs, mittens and scarves, awesome knives and wooden mugs. I bought some amazing unique silver jewelery from cutting edge designers. Yes, there are touristy items, but don’t overlook fun finds. Market Hall is indoors and adjacent to the outdoor area. Not large about 30 vendors. View of Indoor market next to boat. Prety cool! Built 1889 and near the water, vendors can unload directly to the merchants. Old wooden stalls run along two aisles. It is clean with unique foods for the foodie and the curious; bear, reindeer, blood sausage, caviar, veggies, chocolate, jams and coffee. Gravlax. Megatips *Don’t stab reindeer, visit the market. You never know what you are going to find to bring home. 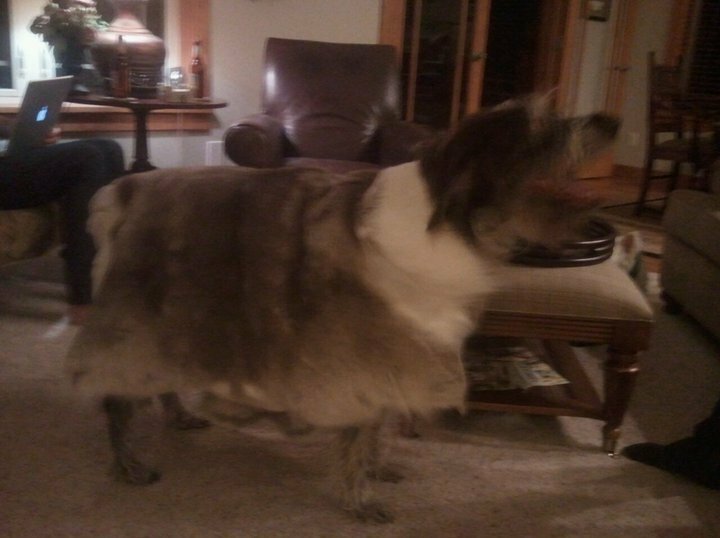 My handsome hunting dog wearing reindee*Ya never know what you might want to do with a reindeer hide. P.S. I am not Ted Nugent. Eat to live. Food for all.